posted by Howard B. Owens in indian falls, log cabin restaurant, pembroke, news. 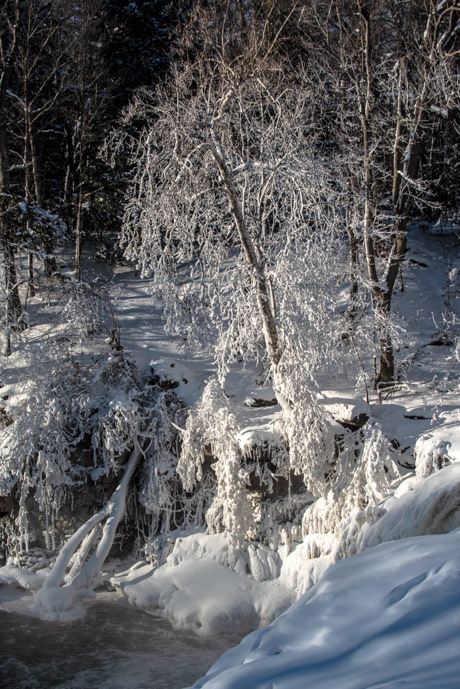 Indian Falls at the Log Cabin Restaurant was a beautiful scene late this afternoon. Here is a short video and a photo. App users: Click here to view the video on thebatavian.com. posted by Howard B. Owens in log cabin restaurant, indian falls, pembroke, corfu, news, notify. By the time Deputy Ryan Young arrived at the Log Cabin Restaurant in Indian Falls at 11 p.m. on April 11, he knew a customer had caused a disturbance in the restaurant and that the customer had fired at least two shots from a firearm. As Young and other deputies arrived in the parking lot that Wednesday night, they heard another shot being fired. Keith Kent, a 61-year-old logging company owner from Albion, spotted by deputies in the parking lot carrying a handgun, did not respond to verbal commands to drop his weapon. At a press conference today about the shooting, First Assistant District Attorney Melissa Cianfrini said, "He began to advance in the direction of Deputy Young, raising and ultimately pointing his revolver at Deputy Young. Deputy Young fired several rounds and Mr. Kent was shot." Kent was hit in his neck and grazed by a bullet across his back. He was pronounced dead at the scene. Following a month-long investigation by State Police -- that District Attorney Lawrence Friedman characterized as "thorough" -- a Grand Jury reviewed the evidence and returned what is known as a "no bill," which means the Grand Jury found no reason to charge Young with a crime. Friedman said the Grand Jury ruled the shooting was justified. While Friedman and Cianfrini are prohibited by law from discussing anything that happened during the Grand Jury hearing, they are free to discuss what the State Police investigation uncovered. The narrative of events starts with Kent trying to talk with a woman at the bar of the Log Cabin. "He was talking with the woman at the bar and she was not receptive, I guess you might say, to what he was saying to her," Friedman said. "He was asked to leave her alone and ultimately was asked to leave the bar and was removed from the bar under protest." After he went outside, either patrons or employees or both continued to observe him as he walked to his truck. By this time, a person at the Log Cabin had already called 9-1-1 and remained on the phone with an emergency dispatcher providing updates as "the situation quickly escalated," as Cianfrini put it. Investigators were not able to determine if Kent retrieved a revolver from the truck or if he already had it on him when he left the bar. He was a valid permit holder for the revolver, Cianfrini said. After reaching his truck, he started to walk back to the bar and fired two shots into the air. "Patrons at the restaurant and employees went down into a basement and began to arm themselves with materials in the basement while hiding," Cianfrini said. "Mr. Kent did re-enter the restaurant and threats were made." There is no evidence that Kent fired his revolver while inside the restaurant. "He was given multiple directives by sheriff's deputies to drop his weapon," Cianfrini said. "He did not comply with those directives." Young was armed with his duty AR-15. As Kent pointed his revolver at Young -- who was 50 to 80 feet away from Kent -- the deputy fired 15 shots, which did not empty his magazine, Cianfrini said. No other deputies fired their weapons during the incident. "I believe that the reason why other deputies may not have discharged their firearms was because of the concern that there may have been patrons in the restaurant area," Cianfrini said. "They weren't fully aware where the patrons or employees in the restaurant were, and so under their standing orders, they were not in a position where they could safely discharge their firearms." The narrative of events was established by witness statements, body camera recordings, 9-1-1 recordings, and the available forensic evidence. "What I can tell you about the body-worn camera footage is that this incident took place during the night," Cianfrini said. "It was dark. There was limited lighting. There were no body-worn camera recordings that directly caught the incident." Friedman said, however, the recordings were useful to the investigation, especially the audio portions of the recordings. Asked if Kent made any statements before being shot, Friedman said he doesn't believe he did. Friedman expressed confidence that the shooting was justified. "I would say, in addition, that throughout this very thorough investigation, interviewing of everyone who was there, there was never the slightest hint that would indicate that this was anything other than justified." posted by Howard B. Owens in crime, pembroke, corfu, indian falls, log cabin restaurant, news, notify. In the next few weeks, District Attorney Lawrence Friedman will need to make a decision he's never had to make in his more than 36-year career as a prosecutor: whether to send a case involving the police shooting of an armed suspect to a grand jury for review. Friedman has not yet seen all the evidence in the incident at the Log Cabin Resturant in Indian Falls a week ago and said he won't make a decision about presenting the case to a grand jury until State Police investigators bring the completed case to him. A week ago, officers were dispatched to the Log Cabin for the report of a disturbance at the restaurant followed by additional reports of shots fired. Upon their arrival on scene, Keith A. Kent, 61, of Albion, reportedly fired another shot. Officers yelled at Kent to drop his weapon. At that time, according to information released so far, Kent turned toward Deputy Ryan Young and may have pointed his handgun at the officer. Young shot and killed Kent. State Police investigators have witnesses to interview, body camera video to review, ballistics and forensic evidence to examine. If all of that supports the version of events released by law enforcement so far, that would seem to point to a justified shooting. Even if that is the case, Friedman said, a grand jury could still be asked to review the evidence. Asked several different ways to try to explain how he will reach a decision on whether to bring in a grand jury on the case, Friedman chose his words very carefully. He wanted to be clear that he hasn't made that decision yet and did not want to say anything that would make it sound like he had made that decision. "I'm not holding back," Friedman said. "I have not decided which way we go between those options." He said some District Attorneys in other jurisdictions always send cases such as this to a grand jury. Others make a decision themselves on a case-by-case basis. "We don’t have a policy of how we handle these cases because there’s never been one, thankfully," Friedman said. The last time a police officer in Genesee County shot another person in the line of duty was 1977 when Batavia PD Officer Douglas Squires shot and wounded William Timoney during a robbery of a convenience store on Oak Street. Friedman praised local law enforcement for their professionalism and restraint in not firing their weapons at suspects in recent years even though in several instances it appears such a shooting would have been justifiable. One of those involves Deputy Young, who was a Le Roy police officer when dispatched to Selden Road after a report of a man being shot in the head. That was on Dec. 1, 2015. When he arrived on scene an alarm came in for a house fire a few houses down the road. As he pulled up, Kyle Johnson fired a rifle in the direction of Young and a fire chief. Young took cover and provided information about the location of the shooter as other officers arrived. Johnson wandered up and down Selden Road for hours, sometimes pointing his weapon in the general direction of police officers. He was eventually taken into custody with no further shots fired. At Monday's Public Service Committee meeting, Chairwoman Shelly Stein commended Undersheriff Gregory Walker on the department's handling of the situation at the Log Cabin. "On behalf of the whole Legislature, I want to commend you, your department for keeping everyone safe, getting everyone home. It’s really a credit to the department." Walker said after the meeting that Young remains on a paid leave of absence and it will be up to him to decide when he's ready to return to work. He is being provided support and assistance from the department. "He's doing as well as expected under the circumstances," Walker told the county legislators. posted by Howard B. Owens in indian falls, pembroke, corfu, log cabin restaurant, news, notify. With police sharing few details, it's still not clear what led to a deadly confrontation between a 61-year-old Albion man and a Sheriff's deputy outside of the Log Cabin Restaurant last night. According to sources, Keith Kent may have gotten into some type of argument after stopping at the restaurant for dinner while on his way home. The argument may have become physical and he may have been hit. It's unclear what happened next, but a source said employees ushered themselves and customers into the basement once the disturbance started. According to Undersheriff Gregory Walker, Kent was confronted by officers outside the restaurant at about 11 p.m. after receiving reports of shots fired. Walker said when officers first arrived on scene, Kent fired a shot. It's unknown what if anything he was aiming at. Officers, according to Walker, shouted commands at Kent but he did not obey them. When he turned toward a deputy and appeared to point his handgun at the deputy; the deputy fired at least one round that struck Kent and killed him. Kent owned a logging business in Albion, Jordan River Logging, on Route 31A. According to news reports going back to the early 2000s, Kent was involved in disputes related to his business. Orleans Hub reported today that Kent had complained in the past about how authorities handled his cases, including one where he was charged with felonies but a grand jury did not indict him following a hearing. He was accused of taking far more trees than he was supposed to from a Barre woman. In an agreement, Kent was to take 40 trees but was accused of taking close to 200. Kent, 61, complained to friends and neighbors, and in letters sent to newspapers, that he was wrongly prosecuted with the charges, hurting his reputation and business. According to a 2007 article in the Buffalo News, David Cain, then 38, was convicted in Federal Court of 17 felony charges, including racketeering, racketeering conspiracy, three extortions, two mail frauds, five arsons, three tamperings with witnesses, conspiracy to tamper with witnesses, and evidence tampering. His brother, Christopher, and cousin, James Soha, were convicted of five felonies each, including racketeering. David Cain was eventually sentenced to 55 years in federal prison. In 2011, Kent sent a letter to several publications, including the Medina Journal-Register, accusing Orleans County District Attorney Joseph Cardone of using incidents stemming from the Cain criminal activity to "create" a crime against him, even though Kent has assisted in the prosecution of Cain. What was your true motive, Cardone, had I not just handed you the key witnesses that gave you no alternative but to indict David Cain Jr., who was later sent to federal prison for 55 years? I had essentially rid Western New York of the worst gang of criminals in the last century after enduring a living hell at their hands. Until I brought you the witnesses and gave you no choice, I received no help at all from you. Was my arrest your attempt to destroy my name and all I’ve worked for because I embarrassed you into doing your job? Kent sued Cardone and lost, with a court ruling that Cardone had "absolute immunity." Kent in his email to the Orleans Hub said he was terrorized for eight years while law enforcement did nothing to protect him or his family. He said he was treated “shamefully” by District Attorney Joe Cardone, the U.S. Attorney’s Office and the U.S. Marshals. The Batavian's news partner 13WHAM was able to conduct a short phone interview with Keith Kent's older brother, Gary, who described Keith as a family man who loved his children. He had a wife, two adult children, and four grandchildren. posted by Howard B. Owens in log cabin restaurant, pembroke, corfu, news, notify, indian falls. UPDATE 11:40 a.m.: The name of the man shot is Keith A. Kent, 61, of Albion. A man who was shot and killed outside the Log Cabin Restaurant late last night was causing a disturbance inside the establishment, according to Undersheriff Gregory Walker, and said at one point, "where are the police?" The man was challenging people inside the restaurant to a fight, trying to convince them to meet him outside, Walker said. Deputies were dispatched to the restaurant a little before 11 p.m. for the disturbance and while in route were informed of the reports that shots where fired. Officers shouted numerous commands for the subject to drop the weapon, Walker said. "He did not comply and the officers had to shoot and did kill the subject," Walker said. The name of the deceased has not been released yet pending notification of his family. Walker said the man did turn and point his gun at a deputy. Walker confirmed that deputies were wearing body cams and body cams were recording at the time of the events. That video footage is still under review. He couldn't say, with the limited information still available, how many officers -- including state troopers and possibly Batavia PD -- were on scene at the time of the shooting. While it appears there were shots fired inside and outside the restaurant that hasn't been confirmed yet through the investigation. Walker said he could not say yet how many shots were fired, either by the subject or by police. The type of handgun used by the subject was not released nor was information released about whether it was legally owned, by whom and whether the subject had a permit. Since the shooting involves a member of the Sheriff's force, there will be an independent investigation of the shooting. Major Edward Kennedy, State Police, Troop A, said the investigation will be conducted just like any other investigation -- the forensic evidence will be gathered, evidence reviewed and witnesses interviewed.